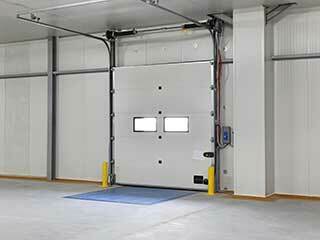 Some parts a system as complex as an automatic overhead door are more important than others. Although every component has a specific role to play, the springs are by far some of the most important pieces of such a system. The reason for that is because they are in charge of supporting the panels' weight and helping the door open and close without you having to put in the extra effort. The nature of their purpose, however, makes them liable to various problems, and dealing with spring related issues can be very dangerous. That's why you need to contact our team when you experience a problem. We have the skills and experience required to safely replace, repair or adjust these dangerous components. There are too different types that are used in manual and automatic garage door systems. Torsion springs are the newer option. They are stronger, more flexible and much safer, due to the fact that rather than extend and contract, they twist and unwind, and are therefore less likely to go flying when they break. The older type is the extension spring. These components are often installed in pairs, one on each side of the door, and they are also secured with safety cables that serve as anchoring points for when the springs break. Garage door torsion springs need to be lubricated regularly to keep their performance smooth and efficient. This reduces their working strain and makes them more silent. Sometimes, spring adjustment may also be required, due to the fact that their tension could loosen and the door may become unbalanced. Spring replacement can be extremely dangerous, and you should never attempt to do it by yourself. Rather, simply give our team at Garage Door Repair Laveen a call and let our professional technicians take care of whatever you need.